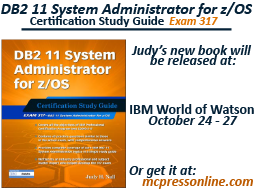 Computer Business International (CBI) is a Db2 for z/OS training and consulting company founded in 1994 by Judy H. Nall, and offers services focused on relational database management, system administration and application programming. Judy has worked with Db2 since the very first release in 1983, and has incorporated into CBI all the years of experience she holds with Db2 and this provides the foundation of knowledge, trust and dedication that is unsurpassed any other. CBI provides Db2 consulting, Db2 training and Db2 mentoring. With an unparalleled understanding of Db2; along with a close relationship with IBM, you are ensured to get the best quality and most reliable solutions for all of your IBM Db2 needs. Our courses are available for onsite or virtual delivery and are geared for up to 15 students per class. All our classes may be customized to fit your requirements at no extra charge. We also provide 1 hour training webinars for those who don't have the time for full day sessions. For more information about this see our webinars page. For complete details on our training programs see: Db2 Training or for complete class outlines see: Db2 Classes. PDF Download: Now That Make Me Happy. CBI expert skills sets provide planning, management and implementation of Db2 services. For full details on CBI's Consulting Services; please see our Consulting page.